Learn how we are committed to patient safety and delivering high quality care to each and every one of our patients. ​APC is committed to patient safety and delivering high quality care to each and every one of its patients. Our goal is treat our patients just as we would treat a member of our own family. For that reason, APC embarked on an extensive quality and safety program which it is continually improving and adapting to the new health care environment. Our Number One Concern is You! Anesthesia Practice Consultants is committed to providing the safest and highest quality service and care for its patients. Over 80 board certified physicians who have nearly two dozen fellowship subspecialty training are focused on providing the best possible care and outcomes for our patients. APC has been a pioneer in developing one of the largest and most robust patient satisfaction surveys in the country in order to provide our patients the same level of care we would expect for a member of our own family. 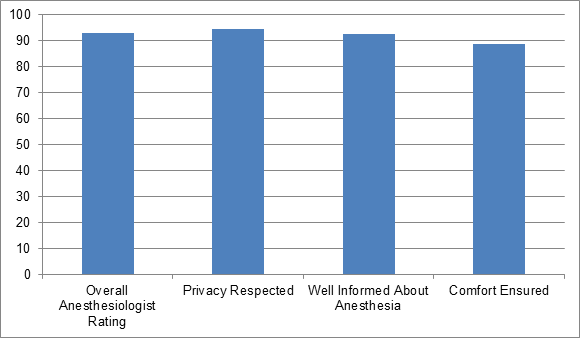 Patients score their anesthetic experience on a number of categories ranging from Comfort, Easing of Anxiety, Privacy, Communication, and Overall Quality of the Provider. *Based on over 10,000 patient survey responses.